VV Tip: If you ever end up with that one lonely banana left over that turns brown, throw it in the freezer. This way, you can keep your bananas perfectly ripe until you’re ready to bake something with them! I usually freeze one here and there until I have enough to make some banana bread or some muffins. Preheat your oven to 400 degrees. Line or grease the wells of a cupcake pan. 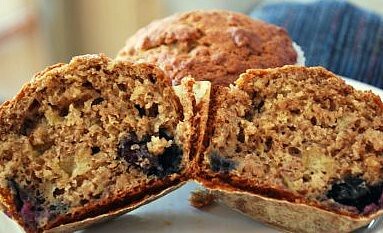 In a large bowl combine flour, oats, sugars, baking powder, baking soda, salt, and cinnamon. Whisk until completely combined. In a small bowl, beat together eggs, applesauce, sour cream, and bananas. Pour the liquid ingredients into the bowl containing the dry ingredients and stir until almost completely moistened. Add the blueberries and continue stirring JUST until completely moistened. Your batter should be lumpy. 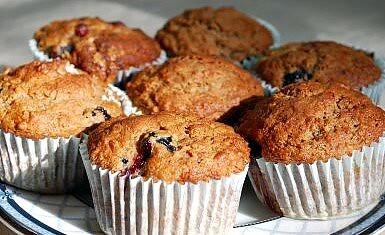 Don’t over-mix or your muffins will be rubbery. Fill muffin cups about 2/3 of the way full. Bake for 17-20 minutes, or until golden brown and a toothpick inserted in the center comes out clean. 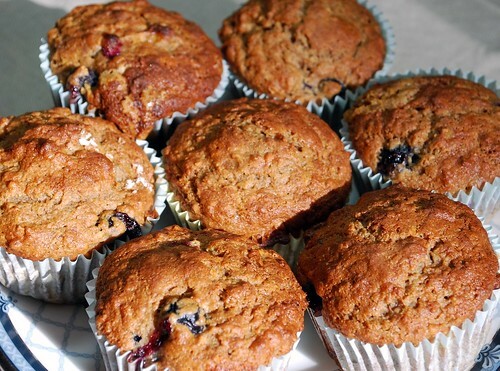 You can mix up the batter the night before and bake the muffins fresh in the morning. They also freeze very well.